The 3D Printing Evangelist: New book available for alpha or pre-order - "3D Printing With MatterControl"
New book available for alpha or pre-order - "3D Printing With MatterControl"
Our new book from Apress, "3D Printing With MatterControl" is now available at http://www.apress.com/9781484210567 either as an "alpha book" now (partial ebook download with rest of book available later) or preorder of the print book. Amazon has it up for preorder, too. "Mastering 3D Printing" was written about a year ago when there were few standards, so it's more of a "why" book to help you think about how to use a printer and where to find more. 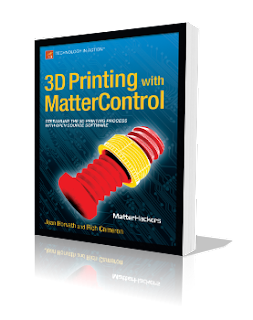 Since MatterControl, from our friends at MatterHackers has emerged since as a widely-used host program, we wrote the new book to be more of an explicit detailed guide to using host software, with some of the broader material too but more of a focus on just exactly how to get a print. We are excited! Joan and Rich at Nerd Nite Comic-Con San Diego!